Deric's MindBlog: Brain system for mental orientation in space, time, and person. Brain system for mental orientation in space, time, and person. Peer and collaborators show that mental orientation in space, time, and person produces a sequential posterior–anterior pattern of activity in each participant’s brain. Processing of spatial, temporal, and social relations relies on mental cognitive maps, on which the behaving self is oriented relative to different places, events, and people. Using high-resolution functional MRI scanning in individual subjects, we show that mental orientation in space, time, and person produces a sequential posterior–anterior pattern of activity in each participant’s brain. These activations are adjacent and partially overlapping, highlighting the relation between mental orientation in these domains. Furthermore, the activity is highly overlapping with the brain’s default-mode network, a system involved in self-referential processing. These findings may shed new light on fundamental cognitive processing of space, time, and person and alter our understanding of disorientation phenomena in neuropsychiatric disorders such as Alzheimer’s disease. 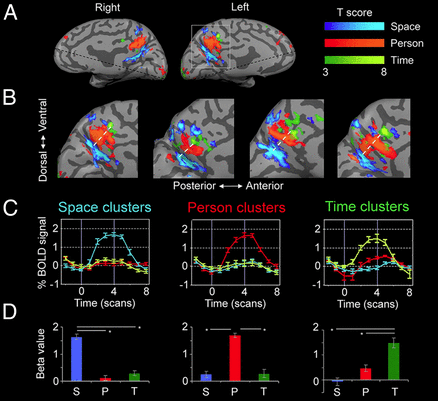 Midsagittal cortical activity during orientation in space, time, and person. (A) Domain-specific activity in a representative subject, identified by contrasting activity between each orientation domain and the other two domains. The precuneus region is active in all three orientation domains, and the medial prefrontal cortex only in person and time orientation. Dashed black lines represent the limit of the scanned region in this subject. (B) Precuneus activity in four subjects, demonstrating a highly consistent posterior–anterior organization (white dashed line); all other subjects showed the same activity pattern (Fig. S1). (C) Group average (n = 16) of event-related activity in independent experimental runs demonstrates the specificity of each cluster to one orientation domain. Lines represent activity in response to space (blue), time (green), and person (red) conditions. Error bars represent SEM between subjects. (D) Group average of beta plots from volume-of-interest GLM analysis, showing highly significant domain-specific activity. Error bars represent SEM between subjects. P, person; S, space; T, time.